The traditional Sassi cave dwellings in the Italian state of Basilicata have been named a UNESCO World Heritage back in 1993. If you’ve been wondering where to stay in Matera Italy on a future trip in order to enjoy a truly authentic experience, you should definitely consider staying in one of these striking places full of old-time charm. Perhaps the most stunning cave hotel Italy has to offer, Sextantio Le Grotte Della Civita occupies one of the oldest areas of the Sassi caves. This spectacular hotel faces the gorgeous Murgia park and includes an ancient church within its rocky walls. The 18 rooms have their own layout, personality, and décor, but all of them include as many original features as possible. Stepping inside one of the rooms, one almost feels transported back in time. Exposed natural stone and antique wooden furniture along with simple linen curtains and rustic details create a distinctive atmosphere. Few windows puncture the original walls, with candles casting their warm orange glow over the cool stone surfaces. Every opening and terrace offers views over the striking natural landscape that includes a steep valley as well as a picturesque countryside. And because staying in Italy should always involve good food, the hotel also offers a range of traditional dishes, handmade delicacies, and local wine to make every guests feels like an Italian. 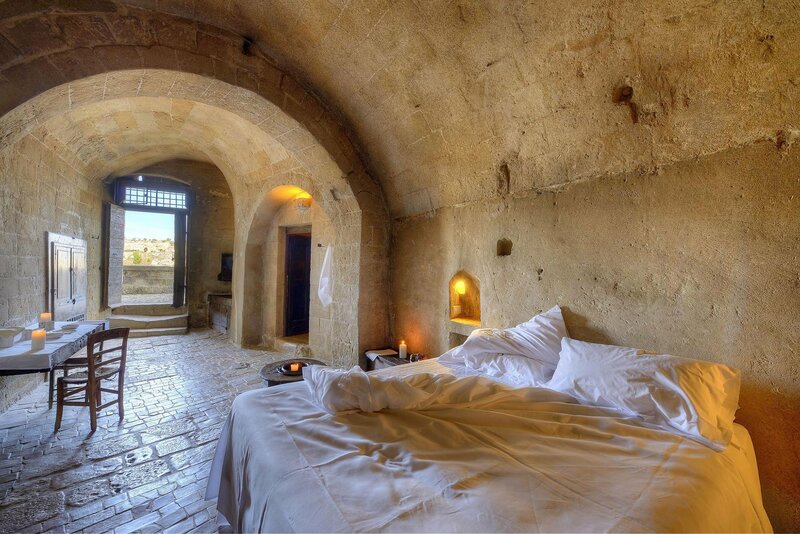 As the most authentic cave hotel Italy has to offer, this one goes right onto our bucket list. Photographs© Sextantio Matera.